For the past five years, SMU has had the Green Wave's number. In fact, since February 13th, 2013, the Mustangs have left the court on top in every single meeting. For perspective, that was Larry Brown's first season, and we were both in Conference USA. That all changed tonight when Tulane came back from a sluggish first half and a 12-point deficit in the second half to secure a signature win. Tulane is now off to a 2-1 start in AAC play (on top of an 11-4 record) that moves the Wave #84 in the latest RPI rankings. Tonight delivered a win that will be remembered at season's end. These Mustangs have knocked off the likes of Arizona, USC, and Boise State. They were expected to finish fourth in the AAC preseason poll, and they looked like a consensus 8-seed according to Bracket Matrix. We've reached January, and Coach Dunleavy's squad sure looks closer to a team "ready to make noise" than a team "that could make noise soon," as most thought before the year. Things didn't look particularly good for the Wave as the team closed out the first half. In fact, with a 36.4% shooting performance from the field and dragged down by a brutal 1 for 10 from behind the arc, the task at hand looked pretty daunting. Tulane needed to close on a 7-point deficit at the half. 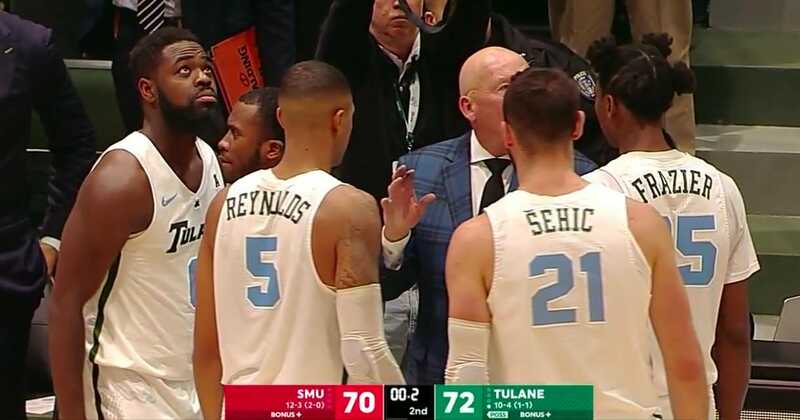 Among the reasons that SMU led solidly at first: Tulane's scoring tandem of Cameron Reynolds and Melvin Frazier were held to a quiet four points each through 20 minutes. That didn't last. Reynolds would come back to hit his first three shots, highlighted by a corner three. SMU continued to threaten for a runaway lead though. Around the 11-minute mark, Melvin Frazier threw down this dunk to bring the Wave within six and change the momentum of this game. Melvin with the SLAM and Tulane is down just 6 for the first time in a while. The energy in the building shifted, and it was on for the Wave. Reynolds and Jordan Cornish would join forces for back-to-back threes to tie the game for the first time with 6:56 left. It felt like the Wave was in control from that point on, even as the Mustangs stayed within three scores for the entire stretch. With 7 seconds left, Vanderbilt transfer Samir Sehic hit both his frees throws to make it a 4-point game. Tulane would close out a 73-70 victory as a significant home underdog. More importantly, they rebounded after a disappointing loss to Tulsa in Devlin to get back on the winning track. A major element of the second half comeback was an outstanding 59.6% shooting performance from the floor. Beyond that, the Wave consistently held its lead in the final minutes of this game, and going 18 for 20 from the charity stripe helped. True freshman Caleb Daniels -- joining Cornish and Frazier among the local standouts on the team -- put together a clutch performance before fouling out. He went 3 for 3 from the floor and 4-4 at the line. Daniels is delivering early in his Green Wave career. As mentioned, Tulane has moved up from 98th to 84th in the most recent RPI rankings. In Ken Pomeroy's advanced rankings, the Wave has reached a season high #120th. Tulane's league schedule will present two important opportunities: a road trip to struggling Memphis and a home bout with UConn (who are coming off four straight losses). Wave has change to capitalize on a 2-1 start in league play. In the post-Clark era, wins like this have been rare. In my memory, this stands out as the best victory (Ken Pom had SMU at #23 entering tonight, and the Mustangs were on the cusp of the Top 25 in the Polls) this early in the season.